You will love this traditional Greek Salad (Horiatiki) that is full of crunch and flavor! The bright, crisp, fresh vegetables, Kalamata olives, capers and feta cheese chunks are dressed simply with good olive oil and red wine vinegar. The traditional Greek Salad (Horiatiki), crunchy, juicy, salty, and creamy. The Greek name for this salad is “Horiatiki Saláta”, which translates to “village salad” or peasant salad. 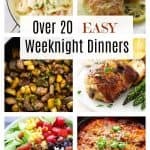 With a mix of fresh, crisp veggies and creamy feta cheese, it is a nutritious, uncomplicated recipe. Our summer garden is in full swing and we are enjoying this traditional Greek Salad (Horiatiki). 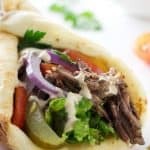 It is an authentic taste of Greece that will transport you to the Mediterranean. You don’t have to grow a backyard garden to enjoy this summer salad. Just check out your local Farmer’s markets or your favorite grocery store. The ingredients are easy to find and kind on the pocketbook. 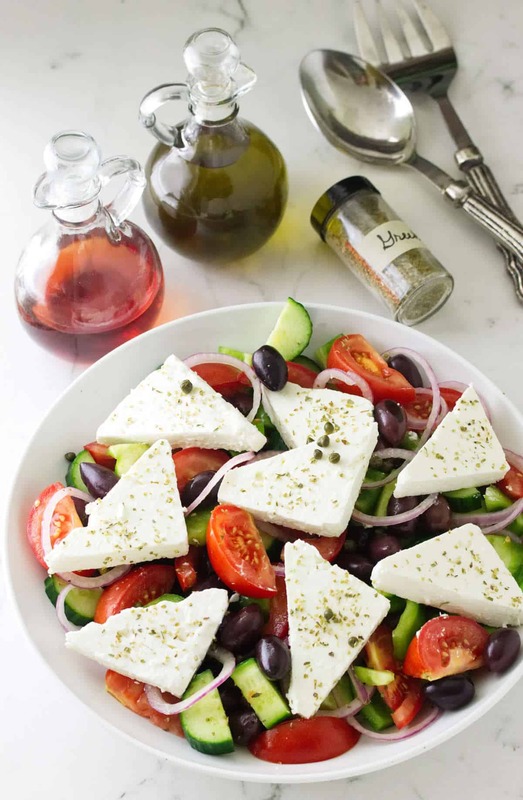 To make this Greek salad, slice and chop an assortment of vegetables. This recipe uses bright-red tomatoes, spicy purple onions, crisp cucumbers and crunchy green bell peppers. Add all the veggies to a large bowl along with plenty of tangy Kalamata olives and salty capers. Next, toss everything with olive oil and a splash of red wine vinegar. Feta cheese is an absolute must in this salad! 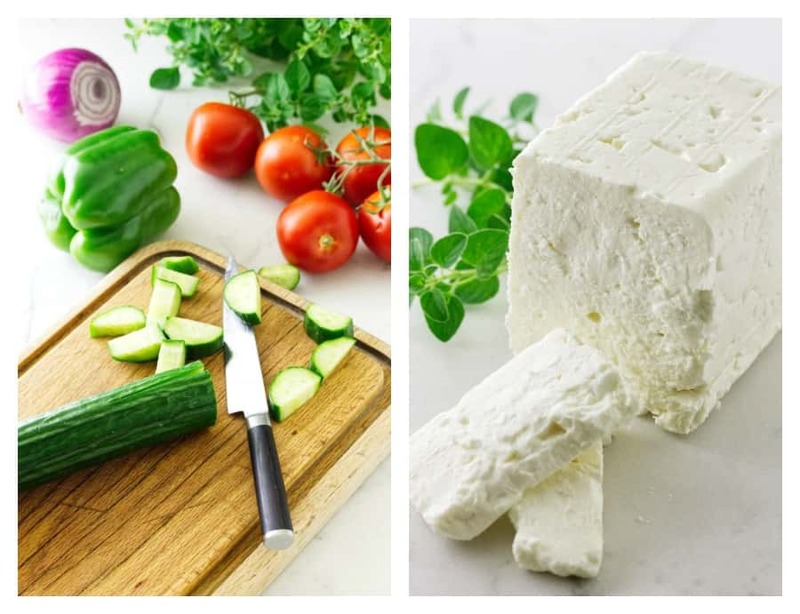 It is not complete without the feta and it just won’t be a Greek salad without this amazing cheese. Top the salad with large chunks of creamy tangy sheep’s milk feta. Next, sprinkle the salad with dried Greek oregano. The Greek oregano gives the salad a distinct and robust flavor. A good flavorful olive oil is the key to the dressing for this salad. 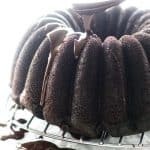 Just a splash of acidic red wine vinegar will balance out the flavors. You can serve additional olive oil for guests to add as much or as little as they like. This is so easy and you can have this salad on the table in less than thirty minutes. Actually, it will be more like fifteen minutes. Bright crunchy fresh vegetables and creamy feta cheese. Is feta cheese made from sheep’s milk or goat’s milk? Although feta cheese can be made from cows milk, in Greece this tangy, rich cheese is always made with sheep milk or a mixture of sheep and goat milk. The Greek’s do not use cow’s milk for feta cheese. The island of Mytilini, also known as Lesvos. Since Greek feta cheese is a regional product, it will differ in firmness and texture within the regions. Also, what the sheep graze on from the different regions will affect the flavor of the feta cheese. Why is feta cheese so salty? Feta cheese has a salty taste because it bathes in a salty brine solution. The longer the cheese is left to brine, the drier and denser it becomes. Feta is usually sold in blocks, thick slices or containers of crumbles. 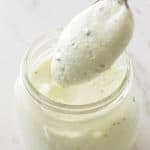 If you purchase the feta and it is not in a brine you should make a brine and keep the feta fully immersed in your refrigerator. 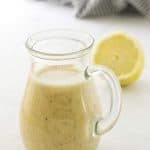 Make the brine at a ratio of two cups of water dissolved with two teaspoons of kosher salt. The cheese will keep refrigerated for several weeks. Feta cheese is salty. 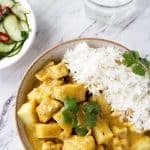 You should keep its saltiness in mind when combining it with other foods. However, if it is too salty for your taste buds it can be rinsed under cold running tap water to remove some of the salty brine. A Mediterranean mezze platter almost always includes feta cheese. Meze is what we Americans would call appetizers, however, as I understand, the Mediterranean’s also serve meze as an entire meal. 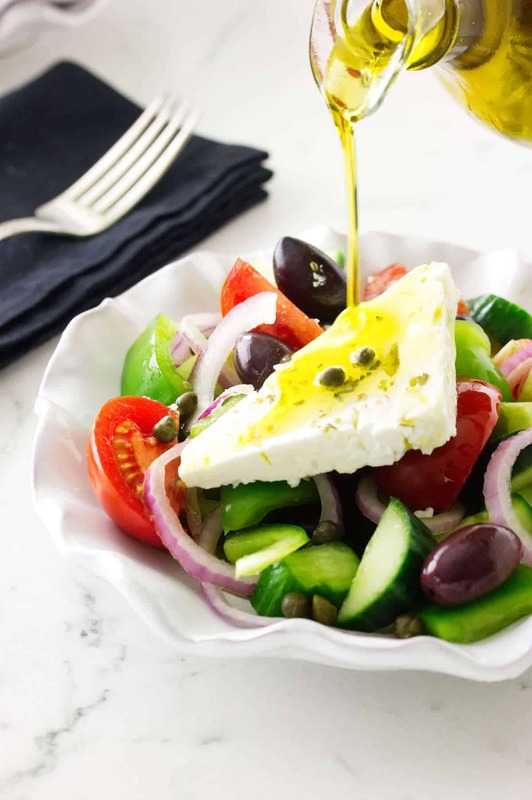 This Greek salad (Horiatiki) is a full meal with the large servings of feta cheese as the protein source. It is complemented with a variety of bright, crunchy, flavorful vegetables, fruity Kalamata olives, and salty capers. Complete the meal with thick slices of warm crusty bread. 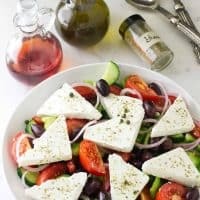 Have you made this Greek salad? We would love to hear from you. Drop us a comment below or tag us on Instagram. 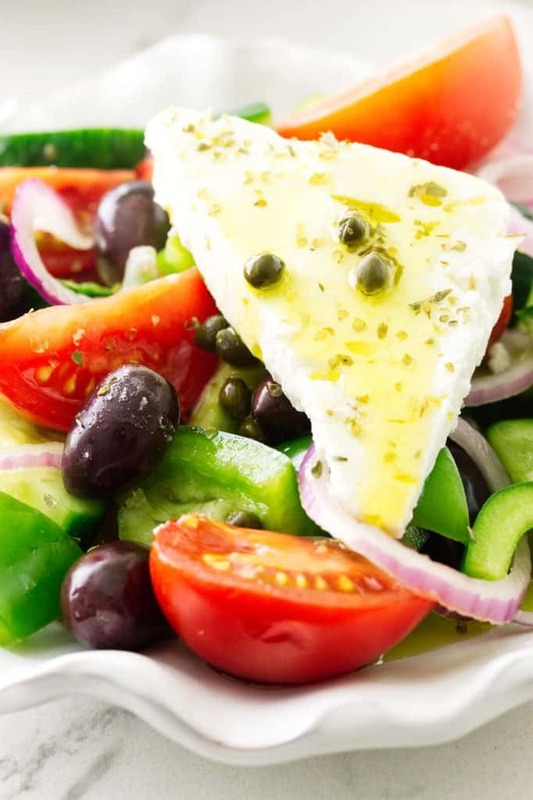 The traditional Greek Salad (Horiatiki) is a variety of bright, crunchy, flavorful fresh vegetables; juicy tomato wedges, crisp cucumber slices, crunchy green bell peppers, fruity Kalamata olives, salty capers and large triangles of thick creamy feta cheese all dressed with olive oil and red wine vinegar. Add the prepared vegetables to a large salad bowl with the Kalamata olives, salt and pepper. Drizzle the olive oil over the top and sprinkle with the red wine vinegar. Toss the salad together and place the feta cheese triangles on top. Sprinkle the capers and dried oregano over the top. Serve with a pitcher of olive oil for guests to add if desired. Alternative serving suggestion: Add the prepared vegetables to a salad bowl with the Kalamata olives, salt and pepper. Toss with the olive oil and red wine vinegar. Divide the salad equally into 4 serving bowls/plates. Place the feta cheese triangles on each serving and sprinkle with the capers and dried Greek oregano. Serve with a pitcher of olive oil for guests to add if desired. Buy the Kalamata olives with pits as they have more flavor than the pitted variety. 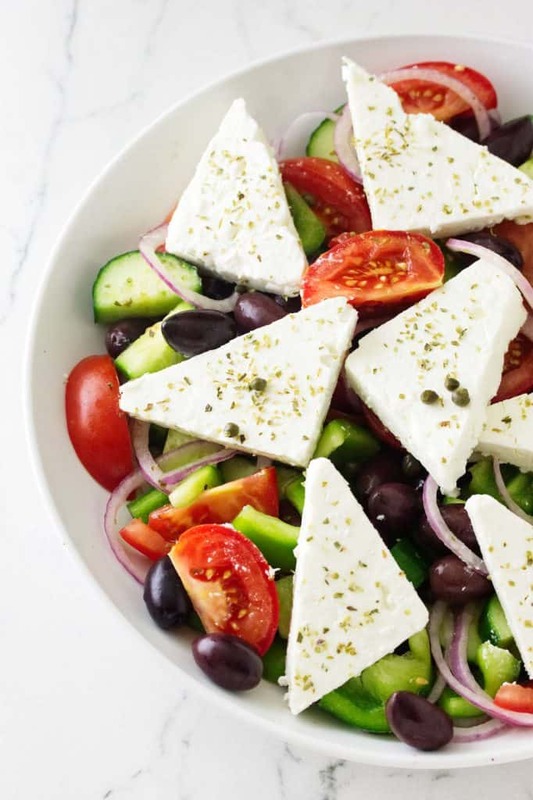 The Greeks add large slabs of feta cheese to their Greek Salad (Horiatiki) so they can control how much cheese goes into each bite. Feta is my absolute favourite cheese. 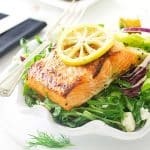 This salad is perfect for a balmy evening! Really love everything about this salad! I could eat this every day! Oh my gosh! This salad looks so fresh and delicious! It’s so warm here, I’ve been having a salad every single day! This might be lunch, thanks! This is the salad I need in this hot weather. Looks delicious. Thanks, Janette 🙂 It is perfect on a hot summer day! LOVE this! I just found out I’m mostly Greek (I always thought I was almost all Italian lol), so I’m making an effort to eat ALL the Greek food! Oh, that is funny, Lauren! 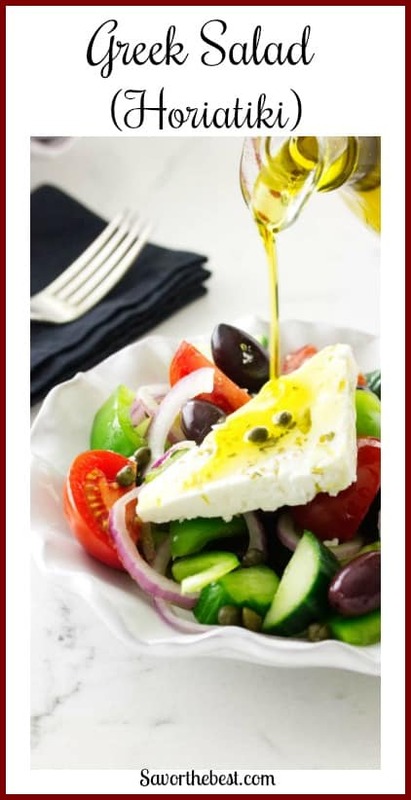 Now you can enjoy all foods Greek, this is a delicious salad….but Italian is good too….try this Panzanella salad, it is a good Italian salad. This is my favourite salad in the world. We ate so much of it when we were island hopping round Greece. Our grocery store is full of produce from local farms at this time of the year. So many choices! I usually end up buying everything. Which is OK, because we’ve been eating a lot of main course salads for dinner lately (it’s been a HOT summer). This would be perfect — enough flavor and nutrition to be satisfying. Really nice — thanks.